Now supports 64K machines - game should also be a bit faster on 128k - so this upgrade should help everyone! New! 'Box art kit' up for download to make your own boxed copy - I won't sell this! you have to do it yourself! mountains lately - and now they are infesting HER castle! the 4 end level boss enemies! portrayed in this game - it's just a silly bit of fun. Please use at your own risk! This is my first Assembly game, so there will be bugs in it! 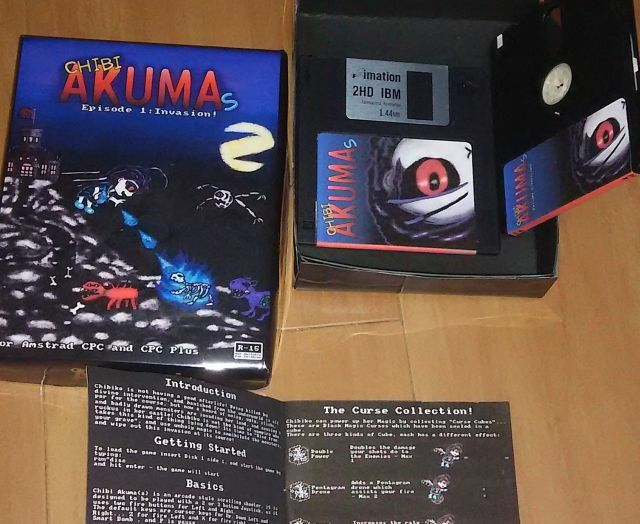 Re: Chibi Akuma(s) - Out now! Looks like some fantastic use of Mode 1 there, I'm assuming that is the Plus version in the video judging from the player sprite? Deathsmiles is easier! I guess that why you get 20 credits. Also, runs well in MAME. Ok... Played it and... finished it (in "normal" mode)! With a highscore of 2035 ("F") . There is a tremendous amount of work on this game. A lot of details everywhere. Horizontal, vertical scrolling, rasters, flickering, many many sprites. The way you handle all this is quite bold! I think the graphics are quite good, and the humor is refreshing. - It is hard to know when you get hit. It's as if the bullets don't really affect the player (no flickering on the character as when the player hits another monster), so many times I died without knowing why. - The sound of the player's bullet is a bit strange . Dear Lord!!! This is awesome. I've just won the game but had to go EASY and 255 lives (used about 30 of them). So much going on but super enjoyable. When I get the chance I'll put it on my HxC and play it on my 6128. The download, I presume requires unzipping and ready to go on Winape!? Oh and appreciate the work and keeping the scene thriving , And it is thriving at the moment! Very very nice job! I was playing today in my modded 464 Plus and it looks awesome. If found some bugs, though. Sadly, the computer froze one time and refused to detect that the floppy 1 was in the unit in another occasion (after dying in the first stage it tried to reload the main menu and kept asking me for floppy 1). When it froze, if was just after redefining the keys, the whole screen went green and the computer engaged the tape deck, same as if you try to load a tape from Basic. This particular machine is atypical though: a 464 Plus upgraded to 6128 Plus by me with X-MEM, X-MASS, Albireo, C4CPC and a HxC (your game was loaded from the HxC). It could be really difficult to debug and probably I am the only one finding problems because of my setup. I had a similar issue on my 6128 PLUS, I was sending some bad OUT's during the raster colors, which were messing my HxC disk on drive 2 - it worked fine on my 6128 non plus - I thought I had it fixed on my release version but your description sounds very similar!- I will recheck my code - and I need to read up on the CPC hardware - the rastercolor code was based on stuff copied from CPCWIKI - and I would be lying if I said I completely understood it - I think some bugs crept in! Like Targhan said, its almost impossible to know when you are hit - there's no indication for this. The bullets that hit your character just keep on moving instead of getting removed off screen. That's my main complain because this fact decreases playability a lot. 4. 3rd disk no longer exists - game now only takes 2 standard disk sides! no content was removed, I tidied up the sprite files to remove some blank space. sorry, Still no 64k support, I need to get the game stable before making the code more complex! Bump to show off my new box/label/manual art! you can download it from the website, and print your own 'official' box! As a bit of a teaser, HERE are some videos of the soon to be released version of Chibi Akuma(s)! The new version should be out in a few days! All other gameplay is the same! All levels present, Gamespeed should be identical, All Plus features work on 64k!! Thanks for your efforts. Very cool. I haven't played it yet but the 464+ shows that a massive work has been done. It should also be slightly faster than the last version, so 128k users should upgrade too. Source-code archive has also been updated. Please report any crashes to me, but otherwise this will be the last release of Chibi Akuma(s) Episode 1 - I want to move on and start work on 'Episode 2'. Re: Chibi Akuma(s) (チビ悪魔) Updated 2017/01/21 - now supports 464! I edited your post to embed the videos. After playing this, even though hell shooters are definitely not my cup of tea (hmmmmm), I can say it's pretty awesome. Not only do I keep going, firing left and right while laughing maniacally, but also the aesthetics of it is really unique. Congrats!! Not my normal type of game either, but I've been enjoying it in the past week or so. I've resisted the temptation to switch to 'Easy' mode so far, but I may have to at some point! The bosses I've seen are fantastically done, the second one is as hard as nails! Please tell me if you figure out a valid tactic for Boss 2! I recording some videos the other day, and was being made to look useless at my own game! Page created in 0.386 seconds with 96 queries.